The movie Hannibal (1959) is a dramatic recreation of the Second Punic War, fought between the two great empires of Rome and Carthage. As the movie begins, viewers are thrown into the midst of Hannibal’s (Victor Mature) Carthaginian army—consisting of soldiers, pack animals, horses, and deadly war elephants—crossing of the Alps, an immense feat,. This spectacle is not downplayed, as Hannibal’s troops are shown marching up steep mountain cliffs, trying to maintain control of their horses and elephants while hindered by the freezing cold. Throughout the entire crossing, Hannibal’s officers relentlessly order the soldiers to “keep marching,” even though some have fallen off the mountain, or been pushed by the horses and elephants. Eventually, Hannibal reaches the summit of the mountain; Maharbal (Franco Silva), Hannibal’s cavalry commander, exclaims “Hannibal! The rations are all gone! The men are freezing to death” and demands that Hannibal “relieve me of my command” (14:50). After their conversation, Hannibal gets word that a barbarian leader and his men, who control the opposite side of the Alps “are surrendering” and that their leader Rutarius (Bud Spencer) “has come down to negotiate” (15:43). Hannibal and Rutarius have a brief conversation in which they make a truce that allows Hannibal to descend the Alps into Italy, while Rutarius is guaranteed supremacy over the region where his tribe lives. After Hannibal descends out of the Alps, he sets up camp near the Trebia. Here, Mago (Mirko Ellis), one of Hannibal’s brothers, brings a Roman slave into Hannibal’s tent who has information about an important hostage. At first, Hannibal is uninterested, and decides to send him away. Then, the slave urgently exclaims, “I threw myself at the mercy of the all-powerful Hannibal, liberator of the oppressed” and tells Hannibal that the hostage is Sylvia (Rita Gam) “the niece of Fabius Maximus” (Gabriele Ferzetti) (25:23). After the slave discusses the location of Sylvia, Hannibal ambushes her and Quintilius (Terence Hill), who is her childhood friend, bodyguard, and son of Fabius Maximus. During the ambush, Sylvia goes into a cave to hide from Hannibal. 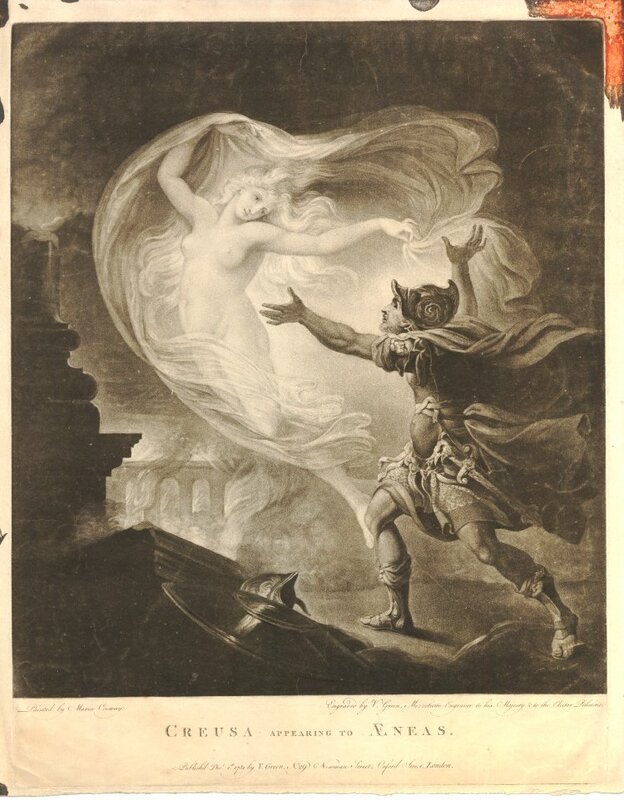 Once Hannibal finds her, Sylvia, not knowing who he is, pleads to “let me and the boy go free” and that if he should “my uncle would pay you very well for delivering us from Hannibal; he could even appoint you officer in one of our legions” (28:35). Not falling for the bribe, Hannibal escorts both of them back to his camp. Back at his camp, Hannibal locks Quintilius in a cage and invites Sylvia to join him in a tour of his camp, as he was stricken by her beauty when he first caught a glimpse of her. While escorting her around his camp, he stops at a vantage point where they can see all of his ally reinforcements and afterwards, Hannibal shows her his elephants, which leaves Sylvia awestruck. At the end of their tour, Hannibal tells Sylvia that “I want you to take a message to your uncle. Tell him that Hannibal seeks peace” (33:48). Sylvia is skeptical towards Hannibal’s notion of peace, but Hannibal reassures her that “The Carthaginians always wanted peace” (34:07). The next morning, he frees Sylvia and Quintilius and allows them to travel back to Rome. Once Sylvia and Quintilius make it back to Rome, Fabius Maximus assures her that she misunderstood Hannibal’s claims for peace, and that it was not peace which led Hannibal to release Sylvia, but his intentions of intimidating Rome. Fabius then goes to the Senate and devises a plan to “tire him, wear him down with skirmishes. Ambush his vanguards. Each day, each hour that passes is another arrow for our bows!” (38:50). The Senate laughs at his proposal and instead decides to attack Hannibal head-on at the Trebia, a plan devised by an unamed Roman senator played by Renzo Cesana. After the Senate discussion, the movie quickly shifts towards the Battle of the Trebia, where the Roman army first sees Hannibal’s mighty elephants. During the battle, Roman soldiers are trampled by the elephants and some are even picked up by the elephant’s trunks and thrown around the battlefield. In the closing stages of the battle, a Roman centurion shouts “we can’t hurt these animals! Fall back men!” (40:55). At the river, the Carthaginian army successfully defends their camp against the Romans who are attempting to sail across on makeshift rafts. The Trebia scene however, is mostly dedicated to showing off the might of Hannibal’s elephants, and is unusually short for being the first major battle in the Second Punic War. Following this victory, Hannibal begins to lose sight in his right eye. 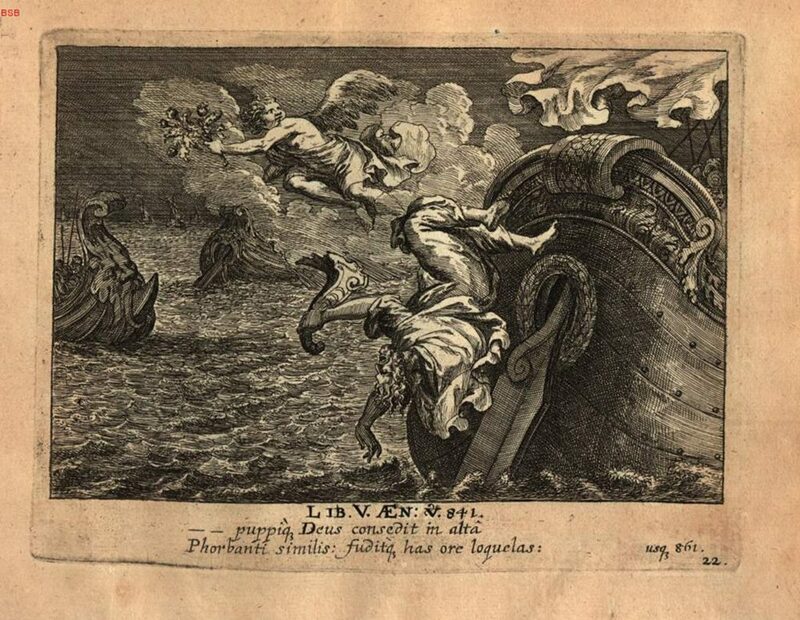 Soon after the battle, Fabius discovers that Flaminius has been replaced as commander. Outraged by this decision, Fabius declares that he will “no longer support with my presence” the decisions the Senate makes (44:51). Fabius leaves the Senate. Meanwhile, Sylvia goes back to Hannibal to try to negotiate peace. However, when she arrives at Hannibal’s camp, she discovers that Hannibal does not want to make peace with the Rome, leading her to ask him “Why did you send for me now?” Hannibal replies “Because I wanted to see you, and I hoped you wanted to see me” (51:36). Quintilius then arrives with a plethora of men and begins to attack Hannibal and some of his horsemen. Eventually, after a lackluster and unrealistic battle scene, Hannibal spares Quintilius and Sylvia yet again and sends them back to Rome. Once they arrive in Rome, Fabius is appalled that Sylvia went back to see Hannibal and betrayed Rome; he sentences her to live out her years in confinement in the Temple of Vesta. The day before her confinement is to begin, Sylvia’s maid brings her good news that “Hannibal has found out; he loves you Sylvia! Hannibal wants you to come to him! He is waiting for you, he loves you!” (57:30). 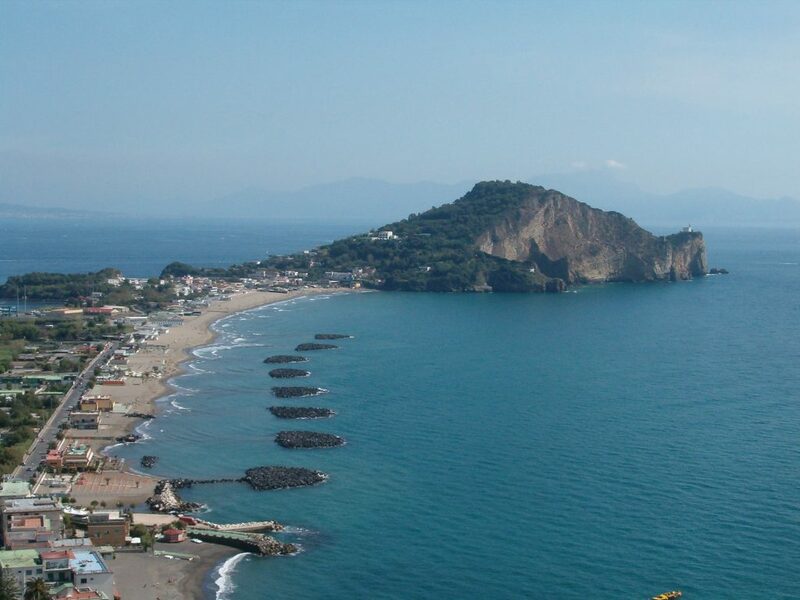 Sylvia flees from Rome, planning to defect to the Carthaginian side for the rest of her days. Meanwhile, the Senate holds a meeting and elects Varro (Andrea Aureli) and Aemilius (Andrea Fantasia) as consuls. Before the Battle of Cannae, Maharbal plans to murder Sylvia because he believes “that girl will be the ruin of us” (59:05). Hasdrubal tries to placate Maharbal by telling him “there is no woman alive who can influence Hannibal.” But Maharbal replies, “No? Then explain to me why he uses every possible reason to avoid combat?” (1:01:20). In an act of mutiny, Maharbal leaves the gates of the elephant corral open, allowing them to run wild inside the camp. 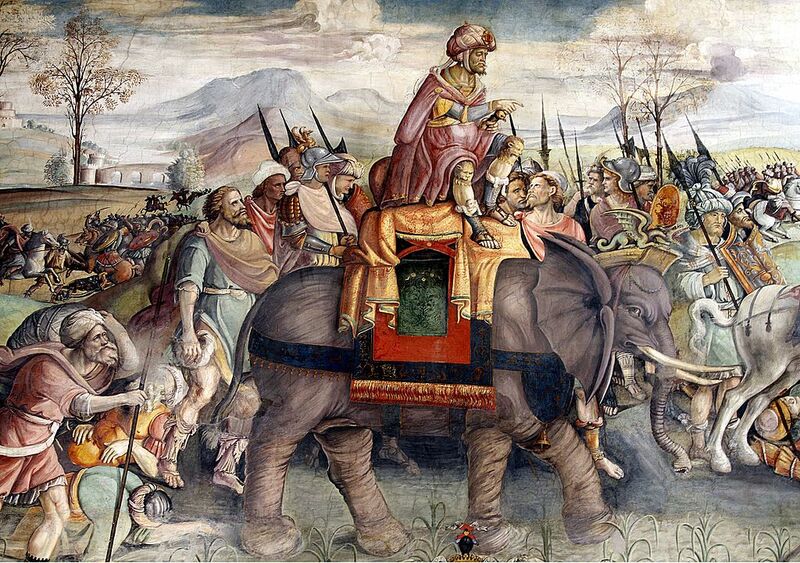 Hannibal bravely saves Sylvia from the elephants and soon after discovers that Maharbal was behind the plot. As a result, Hannibal battles Maharbal until Maharbal eventually loses due to Hannibal’s skill in combat. Hannibal lets him live, stating that “if I didn’t need you I’d…[kill you]” (1:05:40). After Maharbal’s failed mutiny, the Roman army begins to advance on Hannibal’s encampment near Cannae. Hannibal’s strategy is to deceive the Romans in order to surround them in a pincer formation. He plans to send a small infantry unit out into the field and once they see the Roman army, pretend to retreat, thus drawing the Romans closer to the Carthaginian camp. Then, Hannibal plans for two cavalry units to flank the Roman army from behind, trapping the Romans on all sides. Varro and Aemilius argue about the best way to attack the Carthaginians. Aemilius rides up to Varro and exclaims, “Varro please listen to me! It is madness to place the infantry so close to the river. The cavalry has no room to maneuver. You may need their support in an emergency.” Varro confidently replies “It’s my turn today understand me? I am in command obey my orders” (1:10:00). Thus, the Roman army proceeds in compliance with Varro’s commands. Once the battle commences, a Roman cavalry force ambushes the small Carthaginian infantry unit. The infantry retreats according to plan and the Roman army pursues them, believing that the Carthaginians are weak. Hannibal seeing his plan succeeding, slyly states “like rats in a trap” (1:13:35). The fighting begins and the Roman army is soon completely overwhelmed by the Hannibal’s, due to Varro’s faulty battle maneuver. The Roman army signals retreat, but Hannibal orders that “not a single Roman is to leave Cannae” (1:20:50). The Romans are obliterated and while the Carthaginians are surveying the disastrous battlefield, Hannibal finds Sylvia holding a dead Quintilius in her arms. Back in Rome, realizing their strategy for dealing with Hannibal is ineffective, the Roman Senate appoints Fabius Maximus as proconsul, while bringing him Quintilius’ sword. Looking at the sword, Fabius sternly swears to the senators, “Rome will never submit to a foreign invader. In the words of Hannibal himself when he crossed the Alps, ‘conquer or die’” (1:24:08). The scene then shifts back to Hannibal, who is enjoying a lavish victory feast in Capua, topped off by an arena full of gladiators and games. The festivities are cut short though when Hannibal discovers that Maharbal, who he sent to Carthage to obtain more troops, “has just arrived and is in your tent” (1:27:40). Hannibal and Sylvia rush back to his tent, only to find Maharbal with Hannibal’s wife Danila (Milly Vitale), and son. Feeling completely betrayed and heartbroken, Sylvia steals a horse and miserably departs from the camp. Hannibal angrily demands why Maharbal brought no troops, to which Maharbal replies, “if you had followed my advice, Rome would have been destroyed, and Carthage would not have denied you your request” (1:29:49). Hannibal then swiftly grabs a horse and rushes to catch up with Sylvia. Hannibal catches up to Sylvia, and during their conversation, a Roman cavalry unit surprises them, and plans to attack them. Seeing that the men are Roman, and still grieving, Sylvia shouts “Stop! Wait! Take me with you I’m Roman!” (1:32:27). Sylvia returns to Rome with cavalry unit and Hannibal never sees Sylvia again. Hannibal goes back to his tent, where he demands that Danila take her son back to Carthage so that he will never “know the meaning of the words hate and revenge” (1:33:49). While Hannibal is ordering Danila to do this, they hear a loud commotion outside the tent. Hannibal soon finds Hasdrubal’s head in his camp. Hannibal had sent him to Italy to wage war and is informed by Mago that a Roman rider threw the head into one of their outposts. Hannibal and his son embrace and mournfully walk away from the atrocity. In the final scene of the film, Fabius Maximus has arranged for Sylvia to be buried alive for deserting to the Carthaginians. He goes to her cage before the public execution and gives her a vial of poison, showing some mercy towards his niece. While she is being buried, he unhappily looks down at the ring which Hannibal gave her and the scene fades to Hannibal holding the exact same ring. Then, learning that the Romans are attacking his camp, Hannibal prepares for battle. In the final shot of the movie, Hannibal’s austere face is superimposed on the screen with fire and dead Roman soldiers screaming “March!” over and over again, similar to the beginning of the movie on the Alps. However, instead of being merciful, Hannibal is out for revenge (1:39:00). The main ancient Roman historian who writes about Hannibal and the Second Punic War is Titus Livius (Livy). Livy however, does not write solely on Hannibal and the Second Punic War in his work, but instead focuses more on a collective number of people and events. In his Ab Urbe Condita, Livy wrote not only about the Hannibalic Wars, he also wrote 142 books on the complete history of Rome, ending with the reign of Emperor Augustus. Written around 25 BC using earlier historical texts as assistance, only around 25% of the original Ab Urbe Condita remains. The history of the Hannibalic Wars is told in books 21-30. Livy writes about the Hannibalic Wars in order to “provide an account of the most momentous war ever fought” (21.1). Therefore, Livy’s main goals are to provide a detailed and accurate account of the events and battles throughout the war, while oscillating between the forces of Hannibal and the senators and consuls of Rome. Because Livy wants to memorialize the Hannibalic Wars, he writes in great detail about every minute topic relevant to the war. During his account of the war, Livy lists the number of soldiers fighting in each battle, including each force’s respective nativity, as well as the many generals on both sides and the men of notable status who were slain during battle. Livy even devotes a whole paragraph during his retelling of the Battle of Cannae to describing what each auxiliary unit in the Carthaginian army carried into battle (22.46). Livy also discusses with great care events going on in Rome simultaneous to the war, and incorporates dialogue among the Roman Senators. Even though Livy is Roman, he does not falsify Hannibal’s character and perceive him as a barbarian but instead, gives him praise where it is due. For example, while describing the events before the Battle of Trebia, in which Hannibal is in desperate need of supplies, Livy tells how the town of Clastidium held a Roman stockpile of wheat. After capturing the town, Livy states that it “became the granary of the Carthaginians while they remained at the Trebia. So that Hannibal could have a reputation for clemency established right at the start, no harsh treatment was meted to the prisoners from the surrendered garrison” (21.48). Furthermore, Livy is sure to make mention of Hannibal’s allies, in order to show that Hannibal was not only a commander, but a diplomat as well. Livy contributes a large portion of Hannibal’s victories to his alliets, listing all the allied troops who helped turn the tide of the battle. During the initial stages of the Battle of Trebia, Livy states that “when the Numidians struck, Sempronius first led out all of his cavalry” (21.54). Also, Livy uses Hannibal’s crossing of the Alps to credit Hannibal’s diplomacy, as his Gallic auxiliaries “managed to insinuate themselves into conversations with the local mountain men, from whom they differed little in language and customs. Through them Hannibal gained further information that the pass was guarded only by day, and at night all the men slipped away to their own homes” (21.32). Livy understands that Hannibal was a visionary who accomplished great feats in a foreign land, but his ubiquitous mention of Hannibal’s allies helps the reader establish Hannibal as not only a military victor, but as a diplomatic one as well. Without his many foreign allies, Hannibal would have had a much harder time conducting operations in Italy. There are many historical inaccuracies in the movie. The most noteworthy inaccuracy has to be Hannibal’s perceived friendliness towards the Romans, shown through the fictional character Sylvia. In book 21 of his work, Livy tells the story of how Hannibal’s father Hamilcar “brought Hannibal to the altar and there made him swear to make him himself an enemy of the Roman people at the earliest possible opportunity” (21.1). It is, therefore, impossible to believe that Hannibal would ever talk of peace, as well as show passion towards Sylvia, who is a Roman. It is also unlikely that Hannibal would ever allow the son and niece of Fabius to return to Rome; it is more likely he would use them as leverage to gain information about Rome’s military operations. Also, no character resembling Sylvia is ever mentioned in Livy. Her character was invented solely to function as a love interest and add a more interesting facet to the plot; without Sylvia, the movie would have been a war film with only battles and war preparations contributing to the plot. Also invented, is Hannibal’s romantic personality. In one scene in the movie, Hannibal gives Sylvia a ring so that she could pass into Hannibal’s camp without being harmed. Hannibal tells her that “I wanted to see you, and I hoped you wanted to see me” and then proceeds to kiss her (51:36). Later in the film, Sylvia discovers in Rome that “Hannibal wants you to come to him! He is waiting for you, he loves you!” (57:30). Towards the end of the movie, Hannibal is visited by his wife Danila, another fictional character who only serves to heighten the sexual tension between Hannibal and Sylvia. 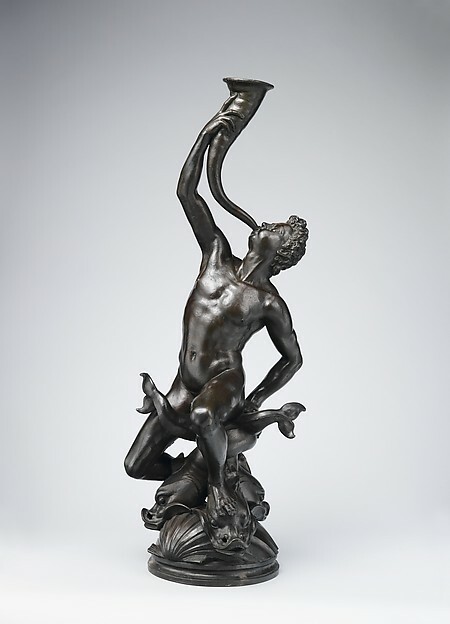 With these two female characters, the directors Carlo Ludovico Bragaglia and Edgar G. Ulmer completely falsify Hannibal’s romantic and familial entanglements. After Sylvia’s execution, Hannibal goes into a fury. Hannibal’s perceived felicity in the film is surely fictitious. In the movie, Hannibal is always smiling and dedicates part of his days towards leisure, particularly seen through his interactions with Sylvia. Hannibal even celebrates his victory at Cannae by hosting a huge luxurious party. Livy writes however that, “his eating and drinking depended on the requirements of nature, not pleasure,” and “the time which he had left from discharging his duties was given to sleep, and it was not brought on by a soft bed or silence” but, “the man’s great virtues were matched by his enormous vices: pitiless cruelty, a treachery worse than Punic, no regard for the truth, and no integrity” (21.4). The Hannibal presented in the last remaining minutes of the movie more accurately matches the one whom Livy writes about. The reason why the movie portrays Hannibal in this way is because it helps enhance his romance with Sylvia. If Hannibal was always sternly focusing on his campaign in the movie, the romance between he and Sylvia would be less believable, as his personality would be more off-putting. However, as stated in Livy, it is extremely unlikely that Hannibal would ever submit himself towards leisure and luxury during his campaigns in Europe. Like Sylvia, Fabius’ son Quintilius is another made-up character in the movie. 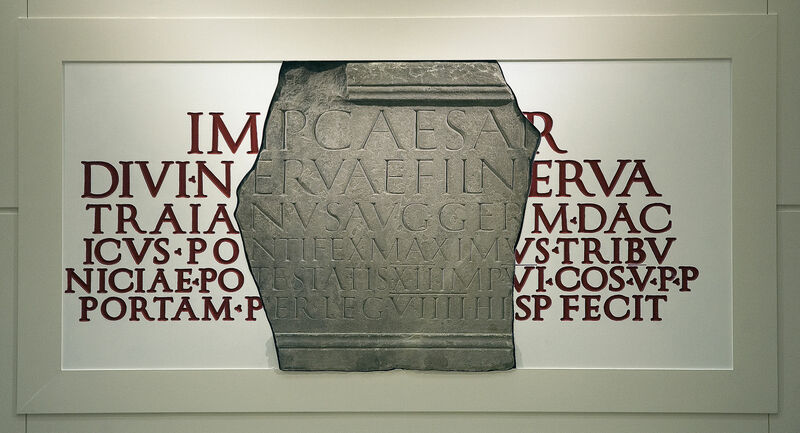 Although Fabius did in fact have a son, his name was also Fabius Maximus and Livy writes that Fabius’ son, many years after the Battle of Cannae, was elected to the consulship (24.43). In the movie on the other hand, Quintilius is killed during the Battle of Cannae. Quintilius dies in the movie because it cements the ineffectiveness of the Romans during the initial battles of the Second Punic War. It also underscores that Fabius’ strategy of delay (cunctatio) was the correct way to deal with Hannibal. Since Quintilius and Sylvia were good friends, his death causes Sylvia’s to question her romance and desertion to Hannibal, adding another dynamic to the romantic plotline. Despite these inaccuracies, the directors do accurately display Hannibal’s diplomacy and usefulness of his allies. In the beginning of the film when Hannibal is crossing the Alps, Rutarius asks Hannibal for the “supremacy of my tribe over all the other tribes in the valley” (16:32). Hannibal grants Rutarius his hegemony and forms an alliance with him, highlighting his unwavering focus on diplomacy. While escorting Sylvia through his encampment, Hannibal makes note of his allies, “my Numidians. And over here is my Libyan cavalry. And over here on my far right are my Spaniards, the greatest horsemen on the continent. And up here are my Carthaginians, the main core of my strength” (31:57). As mentioned in Livy, Hannibal utilizes these auxiliary contingents to secure important military victories for the Carthaginian army. Therefore, the directors understand that Hannibal promoted diplomacy, and allied with many peoples in his quest to invade Rome. In some respects, the movie correctly depicts the difficulty of crossing the Alps. During the crossing, both in the movie and in Livy, Hannibal’s men “could not keep from falling and, even after losing their balance only slightly, they could not, once in difficulties, keep their footing, so that they would fall over each other, and the pack animals would fall on the men” (21.35). Surprisingly, the movie even shows the difficulties of marching the elephants through the narrow passes of the Alps, as the Carthaginians had melt snow and dig through rock in order to form a wide enough passage for the huge beasts (21.37). Even though the movie correctly displays the harsh natural terrain Hannibal encountered during his time crossing the Alps, it makes no mention of the many Alpine tribes which Livy claims “made predatory raids on the head or the rear of the column” (21.35). I believe that the movie strays away from this facet of Hannibal’s march in order to mold him into a more fearful central hero, common amongst sword-and-sandals movies. Thus, during his march in the film, Hannibal and his army are characterized as an unstoppable force that even the great armies of Rome will have difficulty handling. There is also a small amount of historical accuracy during the battle scenes in the movie. The directors do a good job at depicting the battle plans of Hannibal at the Battle of Cannae, at which Livy states Hannibal “deployed his battle line, and provoked his enemy with sudden charges from his Numidian troops” (22.44). At the Battle of the Trebia, the film highlights the importance and ferocity of Hannibal’s war elephants, which were a constant threat during the actual battle in 218 BC. The film over-dramatizes their usefulness, though, and attributes to them a large portion of the victory at the Trebia. In actuality it was Hannibal’s auxiliary forces, especially the Numidians who were “to cross the River Trebia, ride up to the gates of the enemy and entice him out to battle by hurling spears” who contributed the most to that victory (21.54). The over-dramatization of these elephants makes Hannibal, as stated before, a more terrifying central character. The film does an excellent job depicting the constant feud between the two consuls Varro and Aemilius Paulus before the Battle of Cannae. As mentioned in Livy, Varro and Paulus would oscillate each day as the supreme commander of the army, and have endless arguments concerning tactics. Identical to Livy’s description, the movie shows Varro and his followers are “angry and eager to fight” while Paulus “would choose safety over impetuous plans” (22.44, 22.38). Both in the film and in Livy’s work, Varro becomes war-crazed and “without conferring with his colleague in any way, he put up the signal, and led his troops over the river in battle order” (22.45). Although the directors stray away from historical accuracy in their creation of Sylvia and Quintilius, they do a good job accurately depicting Varro and Aemilius, as well as Hannibal’s battle tactics. Maharbal’s disagreement with Hannibal’s strategy is also historically accurate. After winning Cannae, Livy states that Maharbal wanted to “go ahead with the cavalry – so the Romans will know of our arrival before they are aware of our coming.” However, Hannibal “declared that, while he appreciated Maharbal’s enthusiasm, he would need time to consider his suggestion.” In response to this, Maharbal furiously responds, “you do not know how to use victory!” (22.51). In the movie, Maharbal orders Mago to “explain to me why he [Hannibal] uses every possible reason to avoid combat?” after their victory at Trebia (1:01:20). Maharbal hypothesizes that “If you [Hannibal] had followed my advice, Rome would have been destroyed, and Carthage would not have denied you your request [for more soldiers]” (1:29:49). Unlike Hannibal’s unrealistic personality, Maharbal’s depiction in the movie closely represents his personality in Livy. Overall, Livy is less concerned with glorifying the Roman name and is more interested in preserving the fascinating history of Rome as accurately and impartially as possible. Even though Livy covers more than 700 years of Rome’s history, he is exceptionally thorough. He has an extreme attention for detail and describes the number of troops each side had, who was in command, and what auxiliary units were utilized particularly well. Despite being a Roman, he is not afraid to praise the admirable qualities of the Carthaginians, or criticize the Romans for their reprehensible ones. In comparison, the directors of Hannibal praise Hannibal for being a great military commander with tons of ambition. However, through the fictional character Sylvia, the movie is more concerned about generating a “war-romance” film in order to retain the attention of the audience. Because of this, the “action scenes can be desultory” and brief, as more attention is given towards Hannibal and Sylvia’s unlikely romance (Hoberman). Hannibal was directed by the Italian directors Carlo Ludovico Bragaglia and Edgar G. Ulmer and was released in 1959 in Italian under the name Annibale. The movie was not released in the United States until a year later and was not released on DVD until 2004. Funded by Warner Brothers Studios, the movie was shot at Cinecitta Studios in Rome, Italy. Cinecitta studios was founded by Benito Mussolini to promote Italy and fascist ideals through cinema. After the Second World War, Cinecitta Studios was used by many American movie companies because of how cheap it was to film there, the same reason why Warner Brothers chose to use the site. Many other sword-and-sandals movies were also made in Cinecitta Studios besides Hannibal, including Quo Vadis and Ben-Hur (“History of Cinecittà.”). The movie had an estimated four-million-dollar budget (IMDb), which was used to cast “over 4,000 foot-soldiers, 1,500 horsemen, 45 elephants and a vast assortment of war machines” in the Battle of Cannae alone (back of DVD box). Because this movie was filmed in the late 1950s, there were no special effects or use of computer-generated imagery. 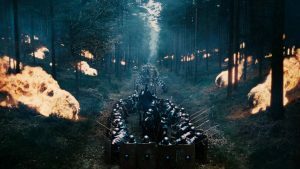 All of the elephants, horses, and soldiers were present during the shooting of the film and all the battle scenes were shot without special effects. This is the main reason why there are very few on-screen deaths and blood during these scenes. Battle scenes were poorly acted and unrealistic. Victor Mature and Rita Gam, Hannibal and Sylvia respectively, were both American actors and are the two biggest stars of the film. They both recorded their lines in English, as opposed to the other members of the cast, who spoke in Italian. For the English version of the film, all the Italian actors’ lines were dubbed over in English. I believe that the directors of the movie cast Mature and Gam in order to gain more publicity with the larger American audience and generate a larger box-office. However, I personally did not enjoy the acting in this film mainly because the dialogue between the characters felt unrealistic, thus bringing down the plausibility of each character. I also believe that the movie’s inaccuracies, primarily Hannibal and Sylvia’s romance, further exacerbated the weakness of the acting. Because I have prior knowledge of the Second Punic War and have read for this project many sections of Livy’s account, I cringed at most of the scenes in the movie because I know that they simply never happened. A review of the film by Variety Movie Reviews said that, “director Edgar G. Ulmer has not accomplished battle sequences and bloodshed very smoothly or persuasively.” I completely agree with this review, as the battle sequences in this film were extremely dull and implausible. Soldiers were able to flee enemies without any pursuit, sword fights were between two men haphazardly swinging their swords at each other with no intention to kill, there were hardly any on screen deaths, and finally, both of the battle scenes were short (Appendix 3). To put it concisely, “the film gets off to an interesting start in scenes illustrating the difficult and costly crossing of the snowy Alps by Hannibal’s army, but slows down to an elephant’s pace in the romantic passages at the heart of the picture” (Variety). Hannibal is categorized under the sword-and-sandals, or peplum, genre. This genre consists of movies that incorporate traditional muscleman films into a historically classical setting. The main sword-and-sandals genre primarily focuses on a hero discovering a wrong and setting out to fix it, culminating in a nice, happy ending. However, Hannibal is very different from this style of sword-and-sandals, and falls into the distinct category of sword-and-sandals movies that mainly focus on plot and character development rather than action sequences, similar to the movie Messalina (Young). I think the movie strays away from action sequences because an hour and a half of fighting and military tactics would only draw in a very specific audience, as the movie would feel more like a documentary than a movie. Without the dialogue and character development, the characters of the movie would be dull and lifeless and the audience would in return feel no emotional attachment for any of the characters. The romance aspect in the film allows the audience to develop emotions for both the Carthaginians and the Romans. However, as mentioned earlier, I believe that the movie is ineffective at achieving these goals due to how unrealistic the plot seemed to be. The movie strays away from the traditional sword-and-sandals genre again in the sense that it neglects a main sword-and-sandals theme of fantasy, usually satisfied by the introduction of mythological heroes or gods. However, Hannibal does share themes with the traditional sword-and-sandals style, mainly a central hero (Hannibal) who fights against a villain (Fabius Maximus and Rome). Also, the movie provides a love interest (Sylvia) for the hero, which is common amongst many sword-and-sandals movies. Because it is predominantly a romance film, the main theme of the movie is that love knows no bounds. Although Hannibal is constantly at war with Rome and Fabius Maximus, Sylvia’s uncle, he nevertheless loves Sylvia and ignores her Roman nationality. Sylvia even abandons Rome and her uncle altogether in order to spend her time with Hannibal. Furthermore, Sylvia stays with Hannibal after the Battle of Cannae after she discovers Quintilius, her lifelong friend, was killed by Hannibal’s army. The scene that does the best job broadcasting this theme is when Hannibal duels Maharbal in a swordfight due to Maharbal’s attempt to kill Sylvia. Even though Maharbal is Hannibal’s cavalry commander and a crucial part of the Carthaginian army, Hannibal puts that all aside when his romance with Sylvia is at stake (59:00-106:00). As mentioned previously, Hannibal even considers peace with Rome due to his infatuation with Sylvia. At the end of the movie, when Hannibal discovers that Sylvia was executed by Fabius, he commands more vigorously and ruthlessly than ever before. As Maharbal states in the movie, Hannibal was controlled by his love for Sylvia (59:00). However, the love between Fabius and Sylvia also contributes to this theme. After Sylvia’s second visit with Hannibal, Fabius spares her from death, because of his love for her. Finally, after Sylvia defects from Hannibal’s camp following Cannae, Fabius, instead of keeping her alive throughout the entire length of her execution, shows mercy final time by giving her a vial of poison. Whether the relationship is between lovers or family members, love in this movie completely defies boundaries. A smaller yet still present theme in the movie is that patience is the key to success. Throughout the movie, Fabius Maximus was ostracized and heckled because of his strategy to, “tire him, wear him down with skirmishes” (38:50). Fabius never pushed his agenda down the Senate’s throat and calmly waited for the senate to realize their mistakes in actively pursuing battle with Hannibal. However, after losing to Hannibal’s army at Trebia, Transimene, and Cannae, the Roman senate named Fabius proconsul, and gave him control over the Roman army and its operations. However, because the film is over-saturated with love and romance, this theme is rarely present. A movie which we watched in class which was made around the same time as Hannibal and is also in the sword-and-sandals genre is Spartacus (1960). Both of these movies are in the same subsection of the sword-and-sandals genre but in my opinion, Spartacus is more interesting than Hannibal because it still has a considerable amount of satisfying action sequences in addition to having a good amount of dialogue and plot development. In Hannibal, the romance between Hannibal and Sylvia is at the forefront, with the war being a secondary plotline in the movie. Because of this, the battle scenes in the movie are forced and unsatisfying. In Spartacus, the romance between Spartacus and Virinia is definitely in the background, as the main plotline of the movie focuses more on Spartacus’ revolt against Rome. Unlike Hannibal, Spartacus’s battle scenes were more realistic, as they were filmed outdoors instead of on sets inside a studio. The actors fighting in these battle scenes were much more convincing as well; they did not blindly swing swords at each other, but had some grace in their movements and actions. I also found Spartacus’ romance to be more convincing than Hannibal’s romance because Spartacus and Virinia were both oppressed slaves serving Rome instead of bitter enemies who in theory should hate each other. For these reasons, I was thoroughly intrigued during the entire runtime of Spartacus, but very bored while watching Hannibal, even though the Second Punic War is a subject that I am very interested in. In my opinion, this film is very weak in its portrayal of Hannibal and the Second Punic War. The battle scenes were atrocious and the soldiers were unintentionally humorous as they blindly swung their swords at each other. If I was shown only these battle scenes without any context, I would think that the movie was a sword-and-sandals parody due to how unrealistic and terribly hysterical the fighting seemed to be. The romance between Hannibal and Sylvia seemed implausible and forced as Livy and other ancient historians note that Hannibal was dedicated to his campaign, had no time for personal luxuries, and would never love let alone mention peace to a Roman. Furthermore, the fictitious characters of Sylvia, Quintilius, and Danila made the movie seem less historically accurate and more fantastical. The only admirable strength in my view is the movie’s portrayal of Hannibal’s determination when crossing the Alps and his diplomacy. Other than those two traits, the movie completely alters Hannibal’s personality, for the worse. When I was initially assigned this paper, I was very excited to watch this movie and learn more about the Second Punic War and Hannibal. However, after watching the movie, I would strongly recommend not watching it because a good portion of it is made-up and the rare scenes that are historically accurate are just plain boring. Although it does a good job in the first twenty minutes depicting Hannibal’s crossing of the Alps, the movie does a lackluster once showcasing Hannibal’s campaign in Italy. Hannibal. Directed by Edgar G. Ulmer. 1960. DVD. “Hannibal.“ IMDb. Accessed May 07, 2016. “History of Cinecittà.” Studios in Rome. Accessed May 07, 2016. Hoberman, J. 2004. “Hannibal (Film).” Film Comment 40, no. 6: 78-79. Film & Television Literature Index with Full Text, EBSCOhost. Accessed May 7, 2016. Livy. Hannibal’s War Books 21-30. trans. Yardley, J. C. and Dexter Hoyos. Oxford: OUP Oxford, 2006. Variety Staff. 1960. “Hannibal.” Variety Movie Reviews no. 1: 26. Film & Television Literature Index with Full Text, EBSCOhost (accessed May 7, 2016). Young, Timothy. “The Peplum.” Peplum Guide and Film Reviews at Mondo Esoterica. Accessed May 07, 2016. Hollywood and History is an on-going series featuring the original work of students in the course Ancient Worlds on Film. Papers have been slightly edited for publication. The film Druids, also known as The Gaul, opens in the year 60 BC, with the people of Gaul facing dire times. Turning to a religious ceremony in order to find a solution to the woes of the Gallic people, the Druids witness a shooting star. The arch-Druid Guttuart (Max von Sydow) proclaims this to be a sign that a new king shall soon come to Gaul, despite the fact that Gaul had long ago abandoned a monarchical government. The film cuts to the Avernian capital, Gergovia, where a young Vercingetorix (Assen Kukushev) shows one of his friends, the daughter of a Gallic chieftain, around the city. He boasts about the meaning of his name, literally translated as “king of great warriors”. He aspires to achieve the power that his name holds, saying that he will one day be the king of Gaul, and tells the girl that she will be his queen. Vercingetorix and Epona, eager to find out what important matters their elders are discussing, sneak into a cave where a meeting of Gallic chieftains is being held. Here, Vercingetorix’s father, Celtill (actor not named) presents to the chieftains the crown worn by the Gallic kings of old. As soon as he does this, two Roman spies disguised as Gauls shoot him in the back with an arrow. Vercingetorix flees from the scene, while Celtill’s brother, Gobanittio (actor not named), detains him. Vercingetorix then watches his uncle burn his father alive, and swears vengeance, saying, “I will kill you, Gobanittio” (00:11:30). The film leaps forward many years, bringing us to a now adult Vercingetorix (Christopher Lambert). He has been educated by Druids, and still holds fast to the childhood promise he made to his uncle. He and Guttuart approach a road that the Romans are building, but Guttuart runs away when Julius Caesar (Klaus Maria Brandauer), accompanied by Roman legionaries, approaches. Caesar attempts to recruit Vercingetorix and the Avernes to help him invade Britain, offering the Gauls half the booty that they will capture. Caesar gives Vercingetorix a horse on which to ride back to Gergovia. Upon arriving, Vercingetorix acts on his promise from so many years ago and kills his uncle. He tells the people of Caesar’s offer, to which they react with great enthusiasm. Vercingetorix presents a Roman soldier with a grisly offering to present to Caesar. The scene shifts to Bibracte, where Caesar meets with various chieftains of Gaul to discuss the British expedition. Many of the chieftains agree with his plans, but Dumnorix (Bernard-Pierre Donnadieu) voices his doubts, saying he will not join the expedition. Caesar, displeased with Dumnorix’s dissent, takes his children hostage. In a private meeting with Caesar, Vercingetorix reunites with his childhood friend, Epona (Ines Sastre). Caesar shows them the crown of Gaul and offers to make Vercingetorix king, saying that the Gallic people could be better off united under a single leader. Vercingetorix refuses, claiming that destiny, and not man, must choose the king. Caesar receives word that Dumnorix has attacked a Roman outpost, and sends Vercingetorix to capture him. Vercingetorix tracks down Dumnorix, who tells him that the Romans were to blame for Celtill’s death. Immediately afterwards, two Roman soldiers assassinate Dumnorix. Vercingetorix chases after them, and kills one. He gives the remaining soldier Caesar’s horse as well as a severed arm of the dead soldier, and orders him to “bring back to Caesar what belongs to Caesar and give my tribute to him” (00:36:03-00:36:13), officially ending the alliance between the Avernians and the Romans. 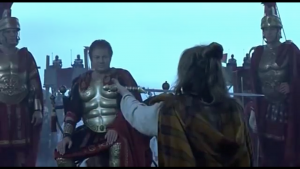 Caesar receives Vercingetorix’s gruesome gift and realizes that the Romans have “made [him] an enemy; and it would be much better to have him as a friend” (00:37:02). He proceeds to place a bounty on Vercingetorix’s head. Vercingetorix heads back to Gergovia, where the Roman guards of the city tell him that he is banished due to Caesar’s decree. He turns away from the city without saying a word. Later that night, Vercingetorix and his supporters murder the Roman soldiers at Gergovia. Having been liberated from Roman rule, the Avernians rally around Vercingetorix; he proclaims that he will only become king if his people want it to be so, not if the Romans choose him for the position. His people give him nearly unanimous support, and he becomes the king of Gaul. Vercingetorix wastes no time putting his newfound power to use, leading scorched-earth campaigns against Roman settlements and burning entire cities to the ground. Vercingetorix spares the city of Avaricum, though his decision to do so was not made without a significant internal conflict between what is right and what is necessary. Caesar, however, orders that all of the inhabitants of Avaricum be slaughtered, causing great pain to Vercingetorix. The Roman army arrives at Gergovia, along with their allies, the Eduens, ready to crush the Avernian resistance. The Avernians attempt psychological warfare, throwing chickens at the Roman soldiers and having their women flash them, hoping that confusion and lust will overpower the Romans’ senses, causing chaos on the battlefield and crippling the Roman army. As the Romans prepare for what seems to be an extremely lopsided battle, it is revealed that the Eduens are extremely upset with Caesar because of his order to massacre the people of Avaricum; they abruptly end their alliance with Rome, switching sides in the conflict. Suddenly outnumbered, the Romans have no choice but to retreat. With victory secured, the chieftains of Gaul assemble and choose Vercingetorix to be the commander in chief of a united army of all of the tribes of Gaul on account of his obvious military genius. The Gauls now feeling that their people may survive the Roman onslaught with their customs unchanged, burn an effigy of Caesar. Overcome with joy, Vercingetorix makes Epona his queen. Unbeknownst to the Gauls, while they were celebrating, Caesar traveled to the Rhine River, where he enlisted the help of the Teutons, fearsome warriors from what is now Germany. The next day, the Teutons ambush a group of Vercingetorix’s men while they are riding through the countryside on horseback. One of the horses returns to the Gauls carrying its dead rider, and Vercingetorix identifies the weapon that killed him as Teutonic. The Teutonic presence in Gaul distresses him greatly, as it demonstrates to him that the Romans will stop at nothing to conquer Gaul. That night, at Alesia, some of Vercingetorix’s men try to convince him to leave, as they have received word that Caesar will attack soon. However, he makes this situation into his own personal Rubicon, going so far as to quote Caesar, saying that Gaul does not need a huge battle but “now the die is already cast” (01:17:41). With this, Vercingetorix seals his fate, essentially saying that he will fight until the end to prevent the Romans from conquering Gaul. The battle begins with the Romans laying siege Alesia, building a series of fortifications around the city. Within, Vercingetorix begins to resort to desperate measures, halving rations so that the Gauls are able to hold their ground longer than expected. He orders his troops to go out into Gaul and recruit as many men as possible into a relief army, but warns them not to attack, as he cannot risk losing any of the people who make up his inner circle. Problems continue to arise in the city, as the Gauls’ food supply drops so low that they are forced to release their horses. In desperation, Vercingetorix suggests sending out everybody who cannot fight, though Epona persuades him to let the children remain in the city. Meanwhile, the Gauls outside the city experience significant difficulty trying to elect a general for their relief army, as people initially try to tamper with the election. When this problem is fixed, they still have difficulty choosing a general, as none of the candidates receive a majority of votes. Eventually the Gauls agree to have four generals of equal rank, The relief army finally arrives at Alesia, significantly delayed because of the infighting. Though Vercingetorix now has the numbers required to take defeat the Romans, he refuses to give to order the attack. In the Roman camp, Caesar tells his advisors that they will starve to death if the Gauls do not attack, stating that their campaign will end either with “triumph or death” (01:31:25). Caesar justifies putting his army at risk of starvation by saying that he has destiny on his side. Unable to wait any longer, the Gauls try to persuade Vercingetorix to attack; he gives in and agrees to lead the Gauls in battle, but not before making it known that they will most likely all be killed, saying, “we will become immortal” (01:36:17). Vercingetorix lays down his arms. Prepared to defend their homeland or die trying, the Gauls rush forth from the walls of Alesia. However, the Romans’ superior military technology immediately becomes obvious, as they mow down Gauls with javelins and arrows before the front lines engage. Finally, Caesar gives the order to release the Teutonic cavalry. This spells doom for the Gauls, as the Teutones prove to be too much for them to handle. The Gauls retreat through a field littered with the innumerable bodies of their fallen comrades. Everyone left behind is slaughtered, including the women and children. The Gauls having been conquered, Vercingetorix gives up the throne. He rides to the Roman encampment where he lays down his arms and kneels at Caesar’s feet admitting defeat. As the film ends, Guttuart narrates what happened afterwards: Caesar is assassinated on the Ides of March in 44 B.C, while Vercingetorix had been executed 2 years earlier. Book 7 of Julius Caesar’s De Bello Gallico is the only ancient source dealing with the life of Vercingetorix. He tells the story with little emotion or extraneous detail, choosing to focus exclusively on the military actions of the Romans and the Gauls, rather than the underlying causes behind said actions. He shows Vercingetorix as an extraordinary military leader, able to use his ability to earn whatever position he desired. The Gauls are said to have fairly advanced military technology, mostly due to being “an extremely resourceful people” (Caesar, 7.22). Among their military technology were such things as ropes designed to entrap and steal Roman equipment and walls that were resistant to both fire and battering rams. When writing from a Gallic viewpoint, Caesar portrays the Romans as brutes; in one speech allegedly made by a chieftain to incite war Rome is said to be rife with “singular and nefarious cruelty” (Caesar, 7.77). Conversely, when writing from the Roman point of view the Aedui are deemed untrustworthy. They first “greatly terrified our men” (Caesar, 7.50), despite being brought in to help the Romans, and ultimately revolted against Roman rule. During battle scenes, Caesar depicts the Romans as underdogs, citing the Gauls’ numbers, position and familiarity with the land as giving them numerous advantages. Despite doing this, he does not downplay the military strength of the Gauls, often referring to them as fierce warriors. Caesar does not rest on his laurels even when Vercingetorix is captured. Rather than praise himself, Caesar simply states, “Vercingetorix was handed over and his weapons were thrown down” (Caesar, 7.88). With sentiments such as this, De Bello Gallico presents a clean, unembellished view of the events that transpired during the Gallic revolt. Caesar provides a less detailed and positive view of Vercingetorix’s early life than the film. Druids suggests the death of Vercingetorix’s father was a Roman conspiracy in order to make the audience sympathize with him and his fight against Rome. In De Bello Gallico, Caesar does not indicate any connection between the Romans and the death of Celtillus; he claims that, “trying to gain a kingdom, Celtillus had been put to death by the state” (Caesar, 7.4). Vercingetorix’s motivation, according to Caesar, was not revenge but the expansion of his territory and the removal of Romans from Gaul. Caesar also contradicts the idea that the Gauls had long ago abandoned monarchy, stating that Celtillus “had held power over all of Gaul” (ibid.). This is one of the major differences between the film and the ancient sources. It is clear that Caesar’s portrayal stems from the fact that Vercingetorix was not seen as superior or inferior to any other barbarian chieftain. Because Vercingetorix holds no special status in Roman culture he is not romanticized or exaggerated in any way. The film and novel do agree on one point, however. Just as the film did, Caesar shows considerable admiration for Vercingetorix’s military ability, referring to him as “a young man whose abilities were second to none” (Caesar, 7.4). While Druids portrays Vercingetorix as a kind and compassionate leader, Caesar portrays him as the opposite. De Bello Gallico depicts Vercingetorix as cruel, stating that for serious crimes, “he killed offenders with fire and all types of tortures” (Caesar, 7.4); for less serious infractions, “he sent offenders home without their ears or eyes” (Caesar, 7.4). Though Druids suggests that the Gauls joined Vercingetorix’s army for the greater good for their country, De Bello Gallico gives a more stark reason for their enlistment saying that many Gauls were compelled to join his army through fear of Vercingetorix’s reputation for cruelty and torture. Caesar views Vercingetorix’s methods of conscription as cruel and unusual, forcing every able-bodied man from every Gallic state to fight regardless of their other responsibilities. Caesar’s commentary also paints the Gauls as being less motivated by the desire for freedom than they are in Druids. Rather than rallying around Vercingetorix and forming an army of their own accord, the Gauls are forced to action on pain of torture, providing a starkly different view of Vercingetorix’s recruitment methods than what is shown in the film. Caesar’s intent in writing his account of Vercingetorix’s rebellion is not to entertain the Roman people, nor is it to show the Romans as superior to the Gauls. His writing is simply meant to inform the populace back in Rome of the current state of affairs in Gaul. While Caesar does occasionally praise the Romans, he does not fail to acknowledge both the ingenuity and the tactical skill that the Gauls displayed in battle. Caesar’s language is extremely plain, meant only to inform people of the events that were happening in Gaul, nothing more and nothing less. Though Caesar’s writing is fairly neutral, it is meant to show the superiority of Romans over barbarians, depicting Caesar’s tactics and strategies as brilliant, spur of the moment ideas, thus pointing out Caesar’s own military excellence. Chris Parry, in his review of the film on efilmcritic.com, opens first by comparing Druids to a low budget remake of Braveheart set in Bulgaria. He then asks, “who knew they could make movies this bad?” (Parry 2002). This question, unfortunately, is one that must be asked while viewing Druids, which in addition to being both a critical and a commercial failure, is often said to be one of the worst French films of all time. The goal of the film was to provide a dramatization of Vercingetorix’s life, an endeavor at which the film fails. Druids is rife with historical inaccuracies, either due to lack of knowledge or accurate sources on the part of the writer/director, Jacques Dorfmann, an attempt to make Vercingetorix more sympathetic, or a combination of all three reasons. 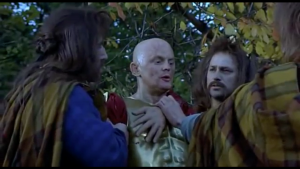 Many of the actors cast in Druids are either virtually unknown or are not known for being in highly regarded movies. For example, the star of the film, Christopher Lambert, is perhaps best known for starring in the Highlander film series, which has always been a critical failure despite its cult following. His performance in Druids is devoid of the power that one would expect from Vercingetorix. Though the young Vercingetorix boasts that his name means “king of great warriors,” Lambert’s Vercingetorix never seems to assert himself. Rather, he allows the soldiers to pressure him into making rash decisions, most notably the Battle of Alesia. Had Vercingetorix refused to attack, the Romans would have starved to death; he chose to listen to his men, though, leading to the annihilation of the Gauls. Perhaps the most famous actor in the movie is Max von Sydow, who previously appeared in critically acclaimed films such as The Greatest Story Ever Told (1965) and The Exorcist (1973), as well as playing Ernst Stavro Blofeld in the James Bond film Never Say Never Again (1983). He remains influential even today, having been cast in HBO’s extremely popular series Game of Thrones as the Three-eyed Raven, a powerful clairvoyant. His appearance in Druids as the arch-Druid Guttuart is almost painful to watch, as the character is limited to prophecies that are meant to sound deep and foreboding, but in actuality have little to no substance. In fact, his character is so bad, and appears so infrequently in the film, that Chris Parry of efilmcritic.com “wondered to [himself] if maybe [von Sydow] had died before the end of the shoot” (Parry, efilmcritic.com). Perhaps the strangest casting choice of all is Klaus Maria Brandauer as Julius Caesar, who is effectively the main villain of the film. He, like Max von Sydow, appeared in Never Say Never Again (1983) where he played Maximillian Largo, the main villain. In that film, Roger Ebert thought Brandauer was “a wonderful actor, and he chooses not to play the villain as a cliché. Instead, he brings a certain poignancy and charm to Largo” (Ebert 1983). This high praise from one of the most well-known film critics of all time offers definitive proof that he is able to play a villain role well; in Druids, however, he has no real motivation for wanting to conquer Gaul other than simply being able to do so. Furthermore, the choice of a German actor turns Caesar into a German, which is blatantly historically inaccurate. Dorfmann may have had an ulterior motive behind choosing a German actor to play Caesar, however, as his German accent may remind some viewers of Adolf Hitler, thus making Caesar seem even more evil. In my opinion, the most prevalent theme in Druids is the unwavering character of Vercingetorix. From the time he is crowned king of the Gauls, to the moment of his capture his loyalty to the Gallic people stands, he puts the good of the state before his own personal benefit. The scene in which Vercingetorix throws down his arms, the lowest point of his life, shows him accepting his punishment yet defiant of Roman ideals, mirroring Lionel Royer’s painting Vercingetorix Throws Down his Arms at the Feet of Julius Caesar (1899). In this painting, Vercingetorix holds his head high and throws his weapons at Caesar’s feet with disdain, while Caesar watches from his throne with disgust. Though he is defeated, he does not show any signs of sadness. Rather, he remains defiant to the end, a symbol to the Gallic people that the Romans can never truly conquer Gaul. The film, though it gives a different visual portrayal of the scene, conveys the same message. In the film, while kneeling at Caesar’s feet, Vercingetorix tells Caesar that what he has witnessed is only the start of a conflict that will last for years to come. Though he may die, others will take his place, and Gaul will continue to fight for freedom from the Roman Empire. In my opinion, the film deserves all of the harsh criticism it has received in the years since its release. It attempts to be a serious film, but is too full of non-sequiturs to be taken as seriously as it wishes. These problems are in full view from the very beginning of the film, which depicts a Gallic religious ceremony. During this scene, priests walk around a fire and instead of wearing historically accurate clothing, they are clad in white robes and hoods, making them look scarily similar to a Ku Klux Klan rally. It remains possible not to laugh at the film for roughly the next seven minutes, until the meeting of Gallic chieftains, which takes place in an enormous underground cavern that appears to have been taken directly from The Lord of the Rings. The film continues relatively free of laughable errors until the scene where Vercingetorix and his followers slaughter the Romans in Gergovia. Here, one of the extras killed during the scene is wearing jeans and a t-shirt. Later, at the battle of Gergovia, the Romans form a testudo. A Roman cavalryman rides past the formation, and his horse clips a shield with an audible thud (00:53:15). Because of this, the soldier almost drops his shield, and his hand reaches out at the last moment to put it back in position. I had to watch three or four times to make sure that I had just seen what I thought I saw. Afterwards, with no explanation whatsoever, the Gallic soldiers bafflingly start throwing chickens over the walls (00:54:36), while the women flash the Romans, tactics that were neither previously discussed, nor talked about afterwards. Before the Battle of Alesia, a scene occurs that has absolutely no connection to any of the events in the film. Vercingetorix is shown playing a game with a small child, whom he accuses of cheating; this leads to his wife, Epona, giving him a lecture on why the rules don’t matter, before he sees some deeper meaning in her words (1:47:12). Finally, when Vercingetorix surrenders himself to Caesar, his son rides with him on the same horse. However, after Vercingetorix enters the camp, his son is left outside, seemingly stranded with no way to get back home, as he is not yet competent at horse riding, making it seem as if Vercingetorix has just doomed his heir. These bizarre errors, as well as many others, completely change the tone of the film, taking it from a serious historical epic to a second rate unintentional comedy. Another heavy source of criticism for Druids is the shocking lack of historical accuracy, which ranges from mistakes in the portrayal of characters, their actions and motivations, to major errors in depictions of equipment used in the film. For example, Caesar is portrayed as a subpar tactician, stating that he would stay camped outside Alesia until either his men starved to death or emerged victorious. In actuality, while Caesar did realize the danger of starvation once the Gauls had “cut them [the Romans] off from a supply of provisions” (Caesar, 7.56), the Romans were never in any real danger of starvation, as Caesar “found a path, suitable for those things which were necessary” (Caesar, 7.56), which allowed the Romans to continue provisioning their entire camp. Furthermore, the film claims that Caesar enlisted the help of the Teutons to win the Battle of Alesia. He was far less dependent on German reinforcements than the film shows, though, mostly using them to augment “the courage of our men” (Caesar, 7.70) when they began to be overwhelmed by the sheer number of Gauls. 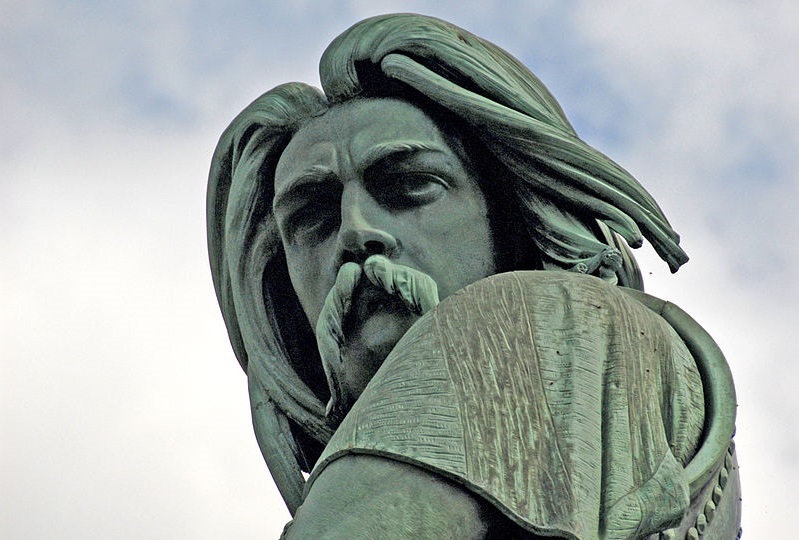 Vercingetorix’s motivations are completely misrepresented. While he did hate the Romans, the film claims he felt this way because the Romans orchestrated the conspiracy which killed his father. In reality, he simply wanted the Romans to leave Gaul. Finally, much of the equipment depicted in Druids is completely anachronistic. One of the major errors is the fact that “The type of armor being used by the Romans is the Lorica Segmentata, which was not introduced until fifty years later, and even then was never in such widespread use” (imdb.org n.d.). Additionally, all the horses are equipped with stirrups, which did not appear in Europe until at least seven hundred years after the events of the film. Finally, while Caesar makes note of the Gauls’ fairly advanced technology, especially relating to their walls, none of this is present in Druids, which instead shows the Gauls as technologically impaired, possibly to make their chances of winning seem even lower. With these blatant misrepresentations of equipment and technology, the film is quite clearly one of the least historically accurate films depicting the conquests of the ancient Romans. Overall, Druids can only be described as being an incomprehensibly bad film. It is full of errors and plot holes, the most notable one being when it simply forgets to name one of the major characters, despite the fact that she constantly trains and mentors Vercingetorix. The historical accuracy is subpar at best, as equipment, technology, and characters are constantly misrepresented in the hope of making the action more cinematically friendly. The film contains a perplexing number of errors made by actors that could have been easily fixed by reshoots, but puzzlingly remain in the film. Individually the historical inaccuracies, bizarre mistakes, and incoherent plot could possibly be forgiven, but when added together, they make for a film that can’t decide if it wants to be a serious historical drama or a lowbrow action film. Without a clear vision, the director created a truly awful combination of the two genres. These flaws, in my opinion, show that Druids truly does deserve its title as one of the worst French films ever made. It started with a grand vision, but something went wrong between the film’s conception and release, resulting in a film so bad that it is almost impossible to watch in one sitting. Druids (aka The Gaul, aka Vercingétorix). Dir. Jacques Dorfmann. Perf. Christopher Lambert, Klaus Maria Brandauer, and Max von Sydow. Centre National de la Cinématographie (CNC), et al. 2001. Beardsley, Eleanor. “How Gaul-ing! Celebrating France’s First Resistance Fighter.” NPR.org. Web. Caesar, Julius and Aulus Hirtius. The Gallic War. trans. Carolyn J.-B. Hammond. Oxford: Oxford UP, 2008. Print. Ebert, Roger. “Movie Review: Never Say Never Again.” RogerEbert.com. Web. Parry, Chris. “Movie Review: Druids.” Efilmcritic.com. 15 Sept. 2002. Efilmcritic.com. Web. 4 May 2016. In AD 117, Rome controlled most of the known world, but it could not control everything. Rome’s frontiers were hotbeds of uprisings and rebellions that could only be snuffed out by the full might of the Roman military. It is in this harsh climate that the movie Centurion (2010) is set. The film opens a harsh and foreboding landscape of crags and ice-covered valleys. Slowly it focuses on a lone figure running for his life, stumbling along the snowy mountaintop. The story is told in retrospect by the main character and opens with his narration, “My name is Quintus Dias, I am a soldier of Rome, and this is neither the beginning nor the end of my story,” before flashing back two weeks (Centurion 3:00-3:57). Centurion Quintus Dias (Michael Fassbender) was stationed at the Roman outpost of Inch-Tuth-Il, located in modern Scotland, when a Pict war-band attacked the outpost under the cover of darkness. The unprepared legionaries were massacred, save for Centurion Dias (Centurion 3:58-6:50). Around this time, the general of the Legio IX Hispania stationed at York, Titus Flavius Virilus (Dominic West), receives a dispatch from Governor Julius Agricola (Paul Freeman) ordering the 9th Legion to prepare for war (Centurion 6:51-10:02). Dias, meanwhile had been taken to a Pict village. There he is tortured and interrogated by the Pict King Gorlacon (Ulrich Thomsen) for information on Roman troop movements (Centurion 10:05-11:46). As Dias is being tortured, General Virilus is meeting with Governor Agricola who outlines the plans for the mission. Rome is on the verge pulling forces out of Britain and he is looking to make one final attempt to conquer the north before those orders arrive. Doing so, he argues, would bring wealth, fame, and honor to them all; despite this appeal, General Virilus states, “My men have honor enough.” Agricola threateningly responds, “Enough to disobey a direct order?” General Virilus gives in to Agricola and is detailed a local tracker named Etain (Olga Kurylenko) to lead the legion to Gorlacon (Centurion 11:50-14:00). The Ninth is led into an ambush. As the legion moves out, Dias escapes and attempts to make it back to Roman territory; on the way he meets up with the legion. Since Dias has just escaped Gorlacon, General Virilus asks him to lead them back to the village from which he escaped (Centurion 14:30-21:25). Unknown to the general, Etain is a double agent for the Picts. She leads the legion into an ambush in the forest where General Virilus is captured and only seven men escape with their lives: Quintus Dias, Thax (JJ Field), Bothos (David Morrissey), Brick (Liam Cunningham), Leonidas (Dimitri Leonidas), and Tarax (Riz Ahmed). As the survivors survey the dead, Dias speaks to the audience as narrator, “In the chaos of battle… it is easy to turn to the gods for salvation, but it is soldiers who do the fighting and soldiers who do the dying, and the gods never get their feet wet” (Centurion 22:30-29:13). Because of honor and duty, the survivors set off to try to rescue the General from the grasp of Gorlacon. Arriving at night, they sneak into the village and try to break the General out of his chains, but fail, due to a war-band returning. During their retreat from the village, Thax unknowingly kills Gorlacon’s son (Centurion 30:00-35:00). The Romans are pursued by trackers led by Etain; knowing they will die unless they make it back to Roman lines, they attempt to lose the following Picts (Centurion 44:00-55:30). As they run, Dias explains to the audience, “My father taught me that in life, duty and honor matter above all things, a man without his word is no better than a beast. I made a promise to the general to get his soldiers home; that is my task; that is my duty” (Centurion 51:00-52:00). Eventually, the trackers catch up to the fugitives along a cliff face. The Romans all jump off into a river below, save for Tarax, who is killed. Jumping into the river, though, causes them to be separated into two groups: Bothos, Dias, Brick, and Leonidas in one, and Macros and Thax in the other. Macros and Thax are chased by wolves, until Thax sacrifices Macros to save himself. Meanwhile, Dias’s group is harassed by the trackers. Bric and Dias attack the trackers camp killing all the trackers there in an attempt to even the odds; however, the Romans later learn some of the trackers led by Etain attacked their camp at the same, leading to the death of Leonidas (Centurion 55:40-1:04:00). Continuing to run, Dias, Brick, and Bothos stumble on the house of a “Necromancer,” named Arianne (Imogen Poots), who houses them, treats their wounds, and hides them from Etain (Centurion 1:04:04-1:16:30). After resting up, the three set out for a nearby Roman outpost. Once they reach it, they find it abandoned with a notice that Emperor Hadrian has ordered a new defensive line to be formed south of the outpost. Knowing they cannot run from Etain any longer, they set up defensively inside the fort and wait for her now small force to attack. When they do, the Romans manage to kill the Picts, including Etain, though Brick dies during the fighting (Centurion 1:17:10-1:24:40). Finally, after weeks on the run the soldiers near Roman territory. As they approach, they run into Thax and he rejoins them. Nearing an under-construction wall, Thax and Dias get into a fight, where Dias kills Thax, because Dias realized what Thax had done to Macros. While this is happening, Bothos over-eagerly makes for the wall and is mistakenly identified as a Pict and shot dead (Centurion 1:25:00-1:30:27). As the only survivor, Quintus Dias is escorted to Governor Agricola to be debriefed. Explaining what happened, Dias is congratulated by Agricola as a hero, but after he leaves the room Agricola’s daughter Druzilla (Rachael Stirling) turns to Agricola and says “We cannot return to Rome in disgrace, better that the fate of a legion remain a mystery than for their failure to be known.” Agricola, immediately agrees with her and takes it one further, “If word gets out, every nation would rise against us.” He has his daughter arrange Dias’s death (Centurion 1:30:30-1:31:36). Quintus sees it coming though; killing his assailants he escapes to the wilds where he returns to Arianne to live out his days (Centurion 1:31:39-1:33:11). In a parallel to the beginning, the story ends with it snowing and Quintus Dias announcing, “My name is Quintus Dias, I am a fugitive of Rome and this is neither the beginning nor the end of my story” (Centurion 1:33:11-1:33:25). This film is about the disappearance of the Legio IX Hispana (the Ninth) in the wilds of Britain. This legend has captivated minds since around 1732, when John Horsley’s Britannia Romana: The Roman Antiquities of Britain was published. In it, Horsley used Roman records to identify the Roman legions stationed in Britain, noting the disappearance of the Ninth from records between the time of Tacitus and the reign of Hadrian (Manea). One of the reasons the disappearance from the records is baffling, is because the Legio IX Hispana was a famous and elite Roman legion created by Pompey and put into service by Julius Caesar (Lendering). 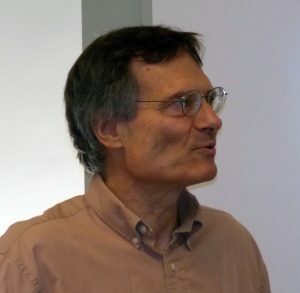 Since Horsley published there has been an ongoing scholarly debate about the fate of the Ninth. Dr. Miles Russell, senior lecturer in Prehistoric and Roman Archaeology at Bournemouth University, contends that the Ninth was wiped out. He cites three pieces of evidence that a disaster of some kind occurred in Britain around AD 118. First, the Roman writer Fronto commented on the large number of Roman soldiers killed in Britain during Emperor Hadrian’s reign in a letter to Marcus Aurelius, indicating some type of heavy fighting. Second, there is a tombstone from Ferentinum, Italy, that describes “emergency reinforcements of over 3,000 men [that] were rushed to the island on ‘the British Expedition’,” early in Hadrian’s reign. His last piece of evidence is that when Hadrian visited Britain, “to correct many faults,” around AD 122, he brought with him the Sixth legion (Legio VI), which was stationed at York (York was the Ninth’s was last documented posting in AD 108). To Dr. Russel, the Sixth’s move to York implies a replacement or replenishing of the Ninth. 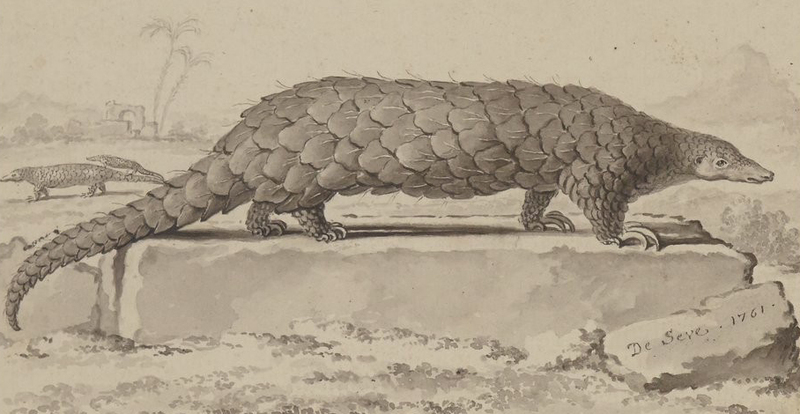 Evidence against this was discovered by archaeologists in 1959. Archaeologists found stamped bricks in Germania dating to after the supposed destruction of the legion around AD 118 (Manea). This discovery gave credence to the argument that the legion was not destroyed in Britain, but was relocated to other parts of the empire. Without written records of troop transfers, it is difficult to confirm conclusively one way or the other. It is within this ambiguity that the story of Centurion exists. When asked why he decided to write about the destruction of the Ninth, even without actual proof, director Neil Marshall replied that, though modern historians tend not to believe the Ninth was destroyed, “I like the myth and I stuck with that” (“Centurion- Neil”). In writing the story Marshall took lots of creative license. One major example is the anachronism of including Governor Agricola. Agricola died in AD 93, almost 24 years earlier (Tacitus l). The real governor of Britain at the time most likely would have been either Marcus Appius Bradua or Quintus Pompeius Falco (Everitt 185, 216). Marshall’s stated inspiration in creating the script was that, “I’d really like to know what could’ve potentially happened to them if this [legend] was real” (Zimmerman). The inclusion of Agricola would at first seem counter-productive, but if one looks at how the addition fits contextually, the move begins to make sense. The legend of the Ninth states that it was ordered north to put an end to raiding in the Caledonia region of northern Britain. This situation parallels the sixth year of Agricola’s governorship as described by Tacitus. During that year, Agricola faced an uprising centered in Caledonia, and moved his army north to combat them. At one point, a large force of Britons surprised the Ninth legion at night, causing severe losses within the legion (Tacitus 25-26.3). In essence, to create a realistic set of events, Marshall took a similar, factual occurrence and placed it within the confines of the legend, trimming the actual event to mesh with the myth. The film also takes license with Agricola’s his character. 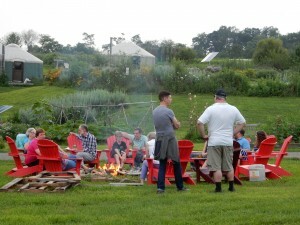 In Centurion, Agricola is concerned with gaining fame and creating a long-lasting legacy. This is seen explicitly during his conversation with General Virilus about mobilizing the Ninth (in which he admits that he wants to be the orchestrator of the final conquest of Britain) and at the end when he fears for his legacy and tries to have Quintus Dias silenced (Centurion 6:51-10:02 and 1:30:30-1:31:36). Tacitus’s Agricola presents the governor in almost complete contrast to the film. Tacitus summarizes his view of Agricola’s character as living a “style of life [that] was modest…. As a result, most people, who always measure great men by their display, when they saw or noticed Agricola, asked why he was famous” (Tacitus 41.4). He “did not exploit his success to glorify himself… he disguised his fame…” (Tacitus 18.7). The difference in characterization can be attributed to the role of Agricola in each situation. For Tacitus, Agricola was his father-in-law, so emphasizing Agricola’s virtues was not only a facet of the medium of biography, but also beneficial to himself and his legacy. In Centurion, Agricola was needed to represent the corruption of politicians who use soldiers as pawns to advance themselves. Etain rides into battle. Tacitus notes that the Britons did not discriminate between genders in selecting their leaders. Another opportunity for artistic license was the depiction of the northern Britons. The tribes of northern Briton are difficult to recreate due to the lack of archaeological evidence about them. The northern Britons are called Picts in the film and they speak Scots Gaelic (Holden), but “Picts aren’t identified in the historical record until AD297, when they crop up in a panegyric by the Roman orator Eumenius,” (Tunzelman) and historians do not know the language the northerly Britons spoke. It would have been most accurate to call the northern people Caledones, after the people referenced in Tacitus, but historians still know no more about them. The only contemporary description is a generalization of all Britons by Tacitus who described them as being more ferocious than their Gaulish counterparts, yet able to be very obedient, but still refusing to be slaves. As for their military and governmental structure, “their infantry is their main strength” and “they are formed into factional groupings by the leading men” (Tacitus 12.1) Interestingly, “they even do not distinguish between the sexes when choosing commanders” (Tacitus 16.1). Even though they are called Picts, the film manages to capture these traits, specifically in Etain’s character—who obeys the Romans for a time but will not be a puppet to destroy her own people— and in how the Pict hunters follow her unquestioningly. One of the most accurate aspects of the entire movie is its depiction of the mood of Rome towards the frontiers, including Britain. Governor Agricola comments at one point that Rome is beginning to pull out of Britain and it is later shown in the notice found by Quintus Dias in the abandoned outpost (Centurion 6:51-10:02 and 1:17:10-1:18:00). This mood of creating a more defensible frontier at the loss of some land was strong within the Roman Empire around AD 117 as Hadrian ascended to the throne. Hadrian began to put into a practice a strategy called “imperial containment” that limited the size of the empire, gave up indefensible territory, and created defensible frontiers as shown by Hadrian’s Wall (Everitt xxiii and 224-225). this entire legion of Roman soldiers that marched into Scotland in 117 AD and vanished without a trace…. I was instantly hooked. I thought, ‘This is going to make a great movie’” (Zimmerman). The next couple of years saw him working on the script. Originally, he considered a sort of supernatural, fantastic element but decided to keep it grounded in history. 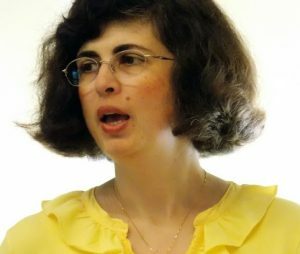 According to Marshall, “I came up with this whole story based on what might have actually happened to the Romans… and then actually, it’s the Romans that create the myth as a cover-up for their own screw-up” (Zimmerman). As the script started to solidify, action star Michael Fassbender became attached to the movie which led to the casting of Dominic West and Olga Kurylenko; Dominic West was approached specifically because of his larger than life presence, needed to fulfill the role of a Roman General, while Olga Kurylenko had recently impressed Marshall with her stunt work as the bond girl for Quantum of Solace (2008) (Eisenberg). With the characters cast, Neil Marshall hired DRS Construction to help build sets designed by Simon Bowles (“Feature Film-Centurion”) and prepared to shoot on location in the Cairngorm Mountains, Badenoch and Strathspey in Scotland, and in Hurtwood Forest, Pinewood Studios, Ealing Studios, and Shepperton Studios in England. To help create the dark and dirty sense of war and to create the feeling of desperation and long odds, the film was shot on location or used practical effects, forgoing the popular use of green screen (“Centurion.” Imdb.com). Director Marshall admitted, “Maybe about 90 percent of the gore effects in it are practical and on-set. Unlike a lot of other directors, I don’t like to leave that stuff until the end of the day, unless I absolutely have to” (Zimmerman). Over 200 liters of fake blood were used during the duration of the shoot (Imdb.com). Finally, to tie everything together, Ilan Eshkeri was hired to produce the soundtrack. Before writing the music, Eshkeri spent time listening to Celtic folk music from all over northern Britain, and drew on it heavily as his influence, even going as far as incorporating Scottish instruments such as the carnyx and the bodhràn. To produce the music, he had the London Metropolitan Orchestra record at Abbey Road Studios (“Centurion”). This combination creates a full epic sound very typical of films in the sword-and-sandal genre. Even though in other aspects of the film, director Neil Marshall went out of his way to set Centurion apart from other sword-and-sandals action movies, thematically it is very generic with one exception. Like many other sword-and-sandals movies the first major theme of the film is that of one’s duty to others and personal honor. Honor is defined by commitment to a cause and keeping one’s word, while duty is carrying out one’s word. It is this simple idea that drives the plot forward. After the massacre of the Ninth, Quintus Dias convinces the survivors to travel north to save the general because it is their duty to the legion and to Rome to try to rescue the General (Centurion 28:40). Later, when the fugitives are on the run due to their failed rescue attempt, Dias remembers his father’s words that honor and duty is what sets man apart from a beast (Centurion 51:00-52:00). This idea can be readily seen in the movie The Eagle, which is also about the disappearance of the Ninth Legion. In The Eagle (2011), the main character Marcus Aquila (Channing Tatum), crosses into the north to reclaim the standard of the Ninth legion and restore his family’s honor, which was damaged when his father lost the eagle. The idea of honor is possibly such a common trope for these types of movies because it is a way to legitimize violence. Violence is brutal and ugly, inflicting terrible emotional and psychological damage. Sword-and-sandal movies feed off this violence, but if the movie cannot justify it, the audience will reject it. Therefore, having characters fight to restore their family, to protect their families, or to right an injustice causes the audience to sympathize with the hero, giving the directors the ability to drive the story through violence. The other major theme of Centurion is the idea that there is no such thing as a black-and white-war; it is always shades of gray. The two main sides in the movie are the invading Romans and the raiding Picts. The story is told from the Roman perspective; from this perspective the Picts are the enemy and they are savage, uncivilized barbarians who threaten civilized society. In truth, the Picts are justified in defending their homeland, though they are not portrayed as all good either since they pillage and kill innocents at will. Neil Marshall feels “that war is not as cut and dry as good guys and bad guys. There are heroes and villains on both sides. Both sides are capable of that kind of brutality” (Zimmerman). This is seen in the main protagonist of the film, Quintus Dias. Though he is part of the invading army, he is fighting not because he enjoys killing Picts, but to protect the settlements south of his posts. He is a man who is driven by the need to do his duty and defend his friends. In essence the film is about a man trying to survive in a world of with no clear right or wrong choices. A unique trait of Centurion is its theme of women being both powerful adversaries and saviors. Normally, in sword-and-sandal movies, women play a secondary role—supporting men, defending a man, or plotting behind the scenes. For example, Varinia in Spartacus (1960) is there to motivate and validate Spartacus and to look pretty, but little else. Queen Gorgo in 300 (2006), is the rare exception of a strong-willed woman in this type of movie, but even she only factors into the plot on occasion, and only to defend Leonidas’s beliefs when he is gone. The two female characters in Centurion defy this established role for women in sword-and-sandal movies. Etain is a warrior greater than many men with skills unmatched by others. She has the ability to lead men unquestioned (Centurion 1:17:10-1:24:40). Arriane on the other hand is able to live alone, takes care of herself, stands her ground against a hunting party, and acts as a savior to Dias and his remaining friends (Centurion 1:04:04-1:16:30). This stylistic change is partially a reflection of the modern times, as well as a representation of a society (Picts/Caledones) that values women more than is normal in these epics. Another way this film breaks the mold of typical sword-and-sandal movies is in its color scheme. “The director of photography, Sam McCurdy, and I discussed it for a long, long time. We wanted this to be a cold movie. We filmed it in cold conditions and it’s a very cold movie as part of being the flipside of what everybody expects in a sword-and-sandals film. When I think of sword-and-sandals movies, I’m thinking deserts and the Middle East and sun and dust and all that kind of stuff. With this one, it’s like, ‘Yes, it is a sword-and-sandals movie. Yes, it’s about the Romans, but it’s in their farthest, grimmest, coldest, wettest frontier. It has to have a totally different feel about it.’ And so we wanted it to have this steely blue feel to the whole thing and make the audience sense what they were going through; the shivers and the chattering teeth and breath, that’s all real as we filmed it in subzero temperatures. In order to help the audience really sense that, we gave just a little of a blue tint to it. It just makes it feel a little colder” (Zimmerman). This cold and icy feel fits into the horror elements incorporated into the film. The horror aspects of gore and an almost supernatural stalker help to heighten the sense of peril, and futileness of the fugitives in the vast wilderness of the north. In comparison to other sword-and-sandal movies, Centurion both succeeds and fails. There is no denying that it has a thin plot that hinges on roughly only two points (the massacre of the Ninth and surviving behind enemy lines), and it pales in this regard next to the greats of the genre like Gladiator or Spartacus; but, it is on par with is close counterpart The Eagle. The other major failing of the movie is its characterization or lack thereof. Other than Quintus Dias and Thax, it is easy to mix-up the other remaining characters. If the characters were left nameless, it would change little to the story. In a way this is akin to the horrendous King Arthur (2004), in which the knights are named but if someone switched their names or changed them completely it would do nothing to the story. These failures lead to a lack of depth in the movie, but it does not greatly affect it because the film does not try make its audience believe it is deep. The movie’s intention is to tell the story of what happened to the Ninth Legion, and why they disappeared from the records; the characters are there to facilitate this and nothing more. Centurion’s successes, I feel, far outweigh these failures. The film does a great job presenting through its large, cold, and gorgeous vistas of mountainous crags and never ending forest, the desperation of soldiers behind enemy lines in an unknown land. It also succeeds in giving a satisfying explanation as to why the Ninth Legion disappears from the records by making it the result of a cover-up by corrupt politicians. My favorite parts of the movie, though were the fight sequences with their practical effects. The gore is at times over the top, but it helps the audience really feel the utter horror of being in the middle of a battle in hand-to-hand combat. Finally, this movie deserves a lot of respect for accomplishing all of this on a budget almost unheard of for action-adventure epics, with a shockingly short filming schedule. Centurion. Dir. Neil Marshall. Perf. Michael Fassbender, Dominic West, and Olga Kueylenko. Warner Bros., 2010. Film. “Centurion (Ilan Eshkeri).” MovieScoreMedia.com. MovieScore Media Sweden. Web. Accessed 3 May 2016. “Centurion.” Imdb.com. Amazon.com Company. Web. 3 May 2016. “Centurion- Neil Marshall Interview.” IndieLondon.co.uk. IndieLongdon.co.uk. Web. 3 May 2016. Eisenberg, Mike. “Interview With ‘Centrion’ Director Neil Marshall & Axelle Carolyn.” Screenrant.com. Screen Rant. 22 August 2010. Web. Accessed 3 May 2016. Everitt, Anthony. Hadrian and the Triumph of Rome. New York: Random House Publishing. 2009. Print. “Feature films- Centurion.” DRSConstruction.co.uk. DRS Construction. 2015. Web. Accessed 3 May 2016. “Gladiator.” Imdb.com. Amazon.com Company. Web. Accessed 3 May 2016. Holden, Stephen. “Two Vastly Different Enemies share a Common Thirst for Blood.” NYTimes.com. The New York Times. 26 August 2010. Web. Accessed 3 May 2016. Lendering, Jona. “Legio VIIII Hispana.” Livius.org. Livius.org. 5 August 2015. Web. Accessed 3 May 2016. Manea, Irina-Maria. “The Enigma of the Ninth Legion.” Historia.ro. Adevărul Holding, 2014. Web. Accessed 3 May 2016. Russel, Dr. Miles. “The Roman Ninth Legion’s mysterious loss.” Bbc.com. BBC. 16 March 2011. Web. Accessed 3 May 2016. Tacitus. Agricola. Trans. A.R. Birley. New York: Oxford University Press, Inc., 1999. Print. Tunzelmann, Alex von. “Centurion has a familiar ring about it, but it’s not because it sticks to the facts.” TheGuardian.com. Guardian News and Media Limited. 19 April 2012. Web. Accessed 3 May 2016. Zimmerman, Samuel. “Fangoria Interview: ‘Centurion’: Marshall-ing Forces.” MichaelFassbender.org. MichaelFassbender.org. 27 August 2010. Web. Accessed 3 May 2016.